Cost will be deducted from your treatment. • AGE PEEL – AGE DEFYING (30 MINS): A superficial chemical peel which reduces fine lines and wrinkles, fades away imperfections leaving the skin smooth and renewed. • WHITE PEEL – DEPIGMENTATION (30 MINS): A superficial peel designed to target sun damage and hyperpigmentation problems. White peel penetrates the skin’s pigment cells to gently and effectively reduce the appearance of unwanted discolouration, for a more even skin tone. • BETAPEEL – ACNE & PROBLEMATIC SKIN (30 MINS): A superficial chemical peel which rapidly brings acne under control and dramatically reduces the risk of future outbreaks. Betapeel targets blocked pores, comedons and inflammation. • EYEPEEL – ANTI-AGING EYES (30 MINS): A superficial chemical peel specifically designed for the eye area (under-eye, crow’s feet, and upper-eyelid). The Medik8 Eyepeel offers an ultra-gentle yet effective solution to treat fine lines and wrinkles. • JESSNER PEEL – ALL IN ONE (UPTO 60 MINS): A superior treatment designed to remove the entire epidermis. A Jessner peel consists of mild peeling agents that can be used to lighten areas of hyperpigmentation and to treat sun damaged skin, mild to severe acne, mild scarring, discolouration and moderate wrinkling. Designed to target different concerns at once, providing great results. Skin needling is a safe and increasingly popular skin renewal technique to restore the healthy youthful appearance of your skin. Micro needles penetrate the top layers of the skin and create pin-point injuries in the deeper layers. This triggers the body’s natural wound healing response. As a result, new collagen and elastin is formed to reduce wrinkle depth, increase skin elasticity and improve the appearance of scars and other flaws. This treatment is great for aging skin and skin with scars. For best results it is important that clients use the recommended Medik8 products which will help to prep the skin before treatment and also assists with the skins regenerative process. 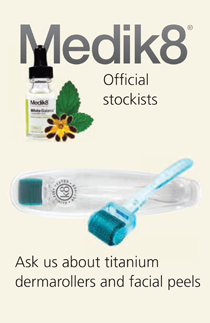 Clients will receive 15% off Medik8 products. Consultation cost will be deducted from price of treatment.